Contrast this bit of kit with some of the farming photographs from the early 20th Century on this website (and with the seed-drill at Alford Heritage Centre and Museum).....what changes! Seed is taken from the hopper at the front and injected at the correct depth with the pneumatic equipment at the rear. 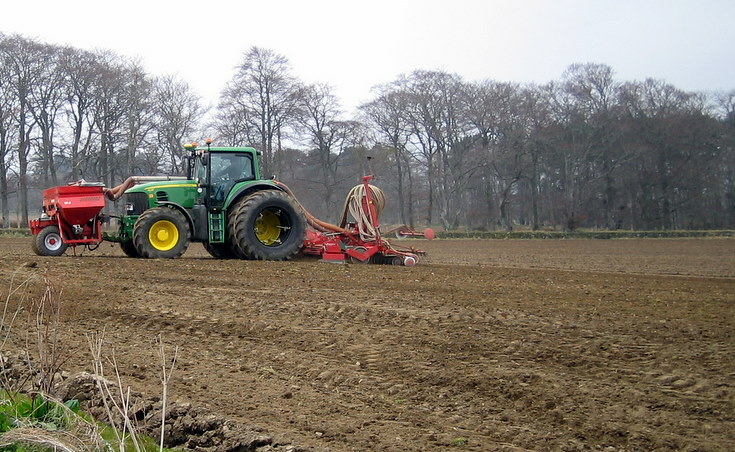 The small yellow saucer shaped object on the tractor cab roof is the receiver dish for the satnav, which allows such things as later fertiliser treatments to be closely matched with digital maps from soil analysis data, so that the treatments are automatically adjusted to the precise needs of the crop in different parts of the field. An on-board computer logs information as the tractor moves across the field. The farmer needs to be competent in IT as well as everything else these days!